The Dungeon Master’s Guide explains all of the tools you can use to build your own custom monster in D&D 5e. However, they don’t actually provide an example of a custom created monster. 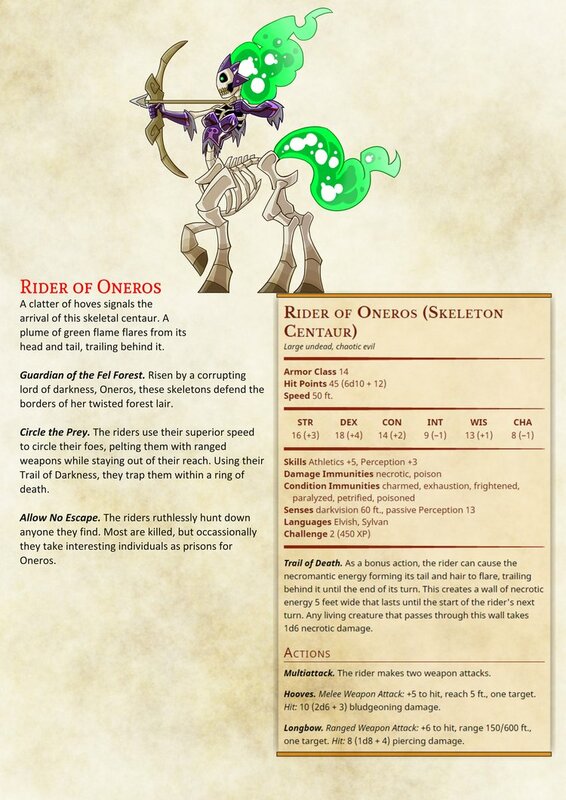 Today I’m going to show you how I came up with the stats and CR for the Rider of Oneros, or the Skeleton Centaur from Trash Mob Minis’ picture. 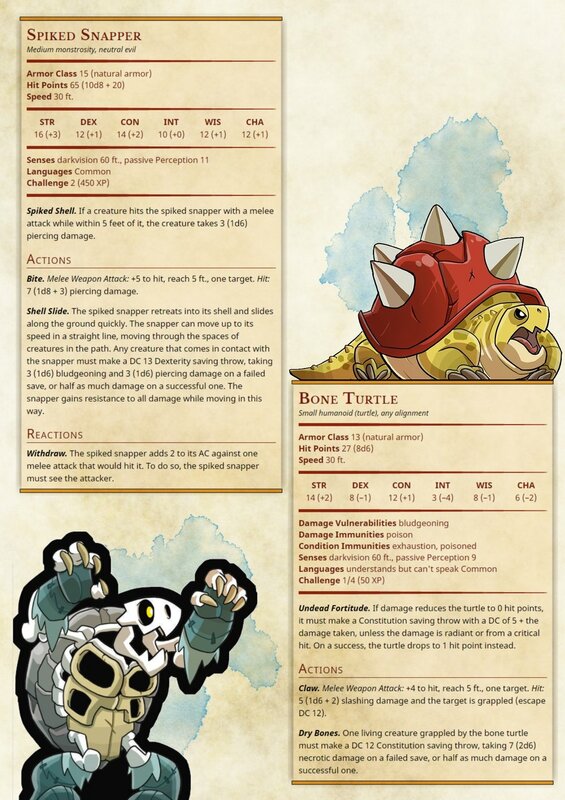 For starters, D&D 5e has mostly done away with monster templates. Instead of having a skeleton template, they just provide a few skeletons that you can use. This means that we’ll have to create our own monster from scratch then, right? Well, you can do that, but there’s a much easier way. Reskinning a monster is when you take that stats from one monster (a troll for example) and just present it as another creature (a human with alchemical infusions that greatly increase his strength and healing factors). This is how I created the Rider of Oneros. 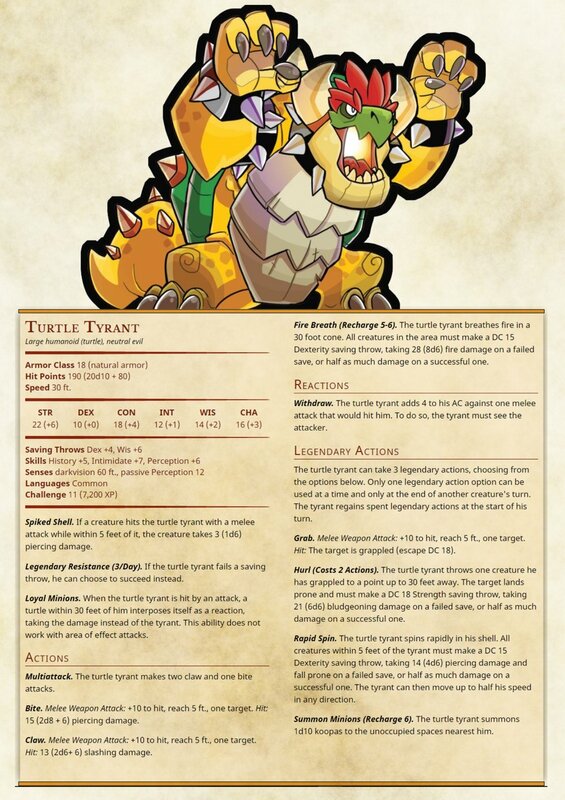 When you reskin a monster, you can make little changes to it that creature a new, unique monster. For statistics, let’s just take the existing Centaur stat block. We can keep the size, but need to change the type to undead (for obvious reasons). Let’s also change the alignment while we’re at it, chaotic evil sounds better for the skeletal guardians of an evil demigod. Now we can make minor teaks to customize the monster for our tastes. I see the riders as being more nimble than strong, avoiding melee combat to focus on ranged attacks. To emphasize this, I’ve switched the Strength and Dexterity scores. Because our monster is a skeleton, I don’t see it being as charming as a normal centaur, so I reduced the Charisma to 8. Let’s move down to skills. It’s fine to keep these, but since the riders are undead I figure that they don’t need Survival anymore. Just remember to modify Athletics due to the lower Strength score. Adding or removing skills is an easy way to personalize a monster, but keep in mind that monsters don’t usually use skills (with Perception being an exception). Now on to vulnerabilities and immunities. There’s a lot to unpack here, being undead an all. What we can do is look at the Skeleton stat block and use what that says. A skeleton has vulnerability to bludgeoning damage, so let’s keep that. They also have a wide range of damage and condition immunities. Start with all of those as a baseline, and add or remove things as needed. Most undead are immune to poison damage and the poisoned condition, for example. Let’s skip abilities for now, and move on to the attacks. The centaur can make two attacks, but we want our centaur to focus on ranged attacks. Let’s take away the pike entirely, and just give it a hoof attack and the longbow. Now we can look at the abilities. This is what really makes your monster unique. The centaur has a charge, but since our riders are going to pelt their foes with ranged weapons, that doesn’t really fit. Let’s take it out. I still want to add something cool and unique to these riders though. I take a look at the picture for inspiration. The green tail and hair is a cool feature, maybe we can do something with that? I imagine the riders as guardians for a corrupting demigod that has taken over a forest, what fits that theme? I decided to go with the Trail of Death. Each rider creates a trail of necrotic energy behind them that causes damage to living creatures that pass through it. This gives the riders a cool visual (think Tron), as well as a unique ability that compliments their playstyle. The riders have a speed advantage on most enemies, and by focusing on ranged attacks they can stay out of reach. With this ability, a pair of riders can run in a circle around their targets, pelting them with arrows at a distance and automatically hurting them if they enter the trail of decay. In order to have this cool visual of a ring of decay and rotating skeletal centaurs, they need to not be affected by their own trail of death. You could add a line in the ability saying that they’re immune to their own effects, but it’s shorter and easier to just give them blanket immunity to necrotic damage. The only other thing we need to calculate is the CR of this monster. Taking a look at the rules and tables in the Dungeon Master’s Guide is important here. First we’ll look at the HP and AC of the rider, which is low at 1 / 2. Next we look at the damage and accuracy, factoring in the two longbow attacks plus the damage from the Trail of Death, which gives us a 3. Average these two numbers for 1.75. The normal centaur is CR 2, so let’s just round the rider to CR 2 as well. Playtesting is an important feature for making sure your CR is accurate, but we shouldn’t be far off. Our rider is built on the centaur chassis, with some features from the skeletons and our own ideas thrown in for diversification. You can check out the monster we created here!